Just last week I saw some Christmas cards posted in a gallery and thought.......I'll not be making any for a while yet. Then I got some lovely punches from Tonic Studios and couldn't resist them. 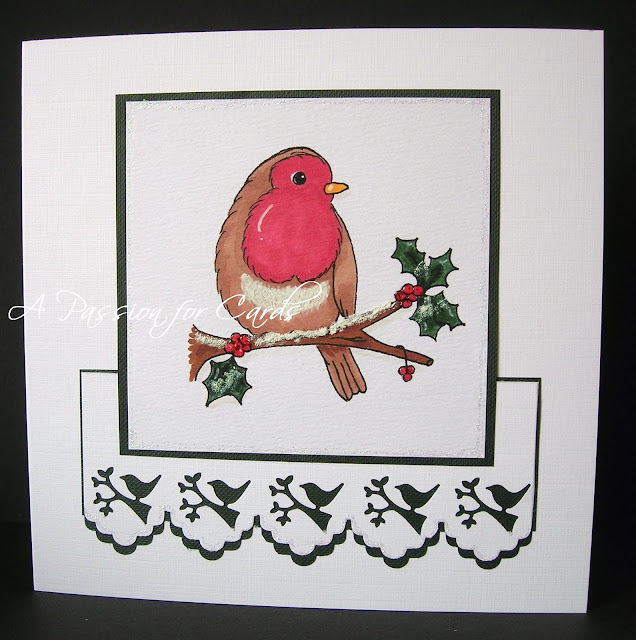 You've probably noticed already that the main one I chose to use isn't even a Christmas punch, but as soon as I saw it I thought it would look great with my Robin digi image from A Passion for Stamps. I've kept the card quite Clean and Simple because I want to enter it into the Less is More challenge which I'm sponsoring this month with a prize of 8 of my digi images. This week's theme is "something that moves". The punch is called Simplicity Geared Punch...Flora and Fauna/Birdy and it's the first time I've used a geared punch. It feels great to use! I have used it as an addition to the Edger punch system and just punched out in the centre of each scallop. The image is coloured with Promarkers and I've also used some DecoArt Snow writer, glitter and Glossy Accents on the holly berries.